Absolut Originality vodka bottles on the conveyor belt. Absolut Originality vodka bottles at the bottling plant. 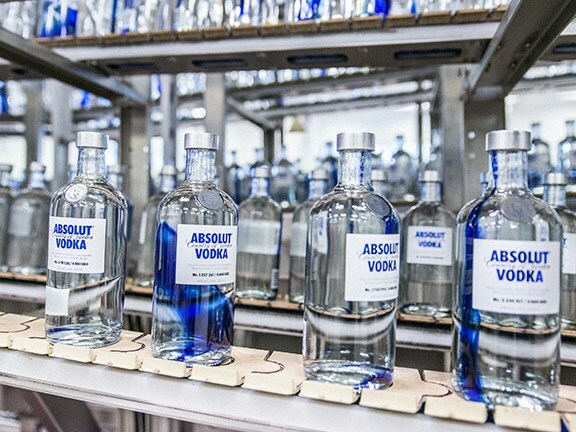 Absolut Originality vodka bottles coming out of the oven. 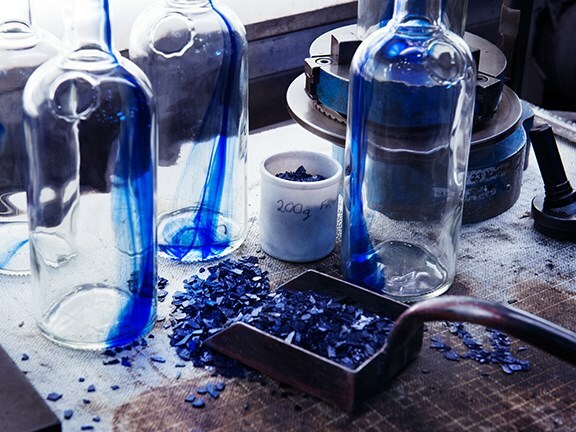 Ardagh used a carefully prepared cobalt colour compound for the Absolut Originality vodka bottles. Packaging solutions company Ardagh has won the Innovation of the Year award at the inaugural Luxury Packaging Awards in London for its development of the Absolut Originality cobalt blue-infused vodka bottles. The panel of international judges say that "by using partial colouring for the first time on a commercial scale with a drop of cobalt blue infused into the molten glass, and completing this in three weeks, something truly remarkable has been achieved". 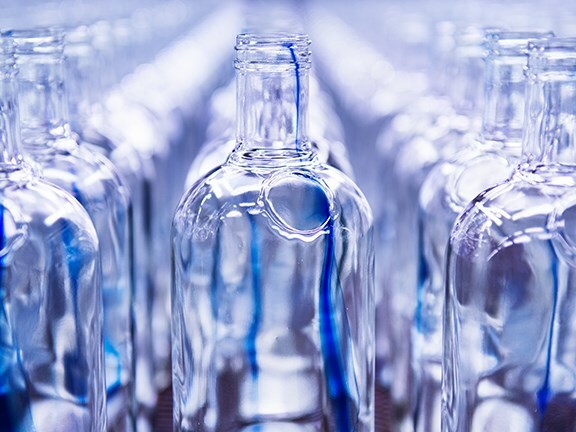 Ardagh Head of Marketing for Glass Europe, Sharon Crayton, says it was a challenging development process by the team at Ardagh’s glass production plant at Limmared in Sweden, "which completely stretched the boundaries of packaging design and execution". "Innovation is in Ardagh's DNA from concept through to completion, and to receive this award brings welcome recognition for the whole team," she says. Using partial colouring for what is believed to be the first time on a commercial scale in the glass container industry, Ardagh produced a limited collection of four million individually designed bottles. Each one represents a "unique work of art", the company says, achieved with a ‘drop’ of cobalt blue infused into the molten glass at the ‘hot-end’ of the production process. 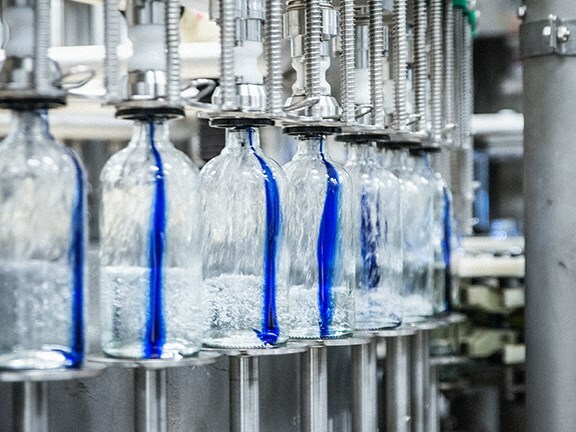 "The concept takes unique bottle design to the next level, where the decoration is achieved within the glass container, rather than being added to the outer surface of the bottle after production," says Ardagh CEO Glass Europe Johan Gorter. The company says the project began as a playful experiment taking inspiration from traditional Swedish glass craft. "When we watched a drop of cobalt sink into the hot glass for the first time we didn’t know what it would look like," says Absolut Global Brand Director Mathias Westphal. "But the very first bottle looked amazing." Ardagh used a carefully prepared cobalt colour compound (frit) supplied by Ferro, and specialised hot end equipment from Füller Glastechnologie.